Sketch Engine is a brilliant tool for product naming and brand development. Read about how our users describe the use of Sketch Engine for naming and brand development. Sketch Engine is a great source of product name ideas. Just type a word that comes to your mind first as a plain description of your product or service and let the automatically-generated thesaurus help you with product name suggestions. The thesaurus produces a list of similar words or words from the same category which will stimulate the creative minds of product naming professionals. The thesaurus is generated automatically and as such, it is not limited by space or human costs which means that a thesaurus entry of virtually unlimited length can be generated for any word in the language. While the top of the list is likely to contain predictable equivalents, scrolling further down will bring less direct and less similar alternatives which might give rise to new brands, trademarks and product names. There is no limit to how far from the original word the user can go. Read this post to understand how automatic thesaurus works. Product name ideas (thesaurus) can be generated in 30+ major languages. The beginning of the thesaurus entry shows words used in very similar contexts as lipstick. They are not necessarily synonyms, they may be words from the same category or used to speak about a similar topic. The words listed further from the beginning are words that are used in more distant contexts. They may be related only marginally to the search word or even unrelated but they can be still used to stimulate the imagination of a product naming professional. One part of product naming is the actual development. It is, however, equally important to check connotation the proposed name has. The ideas or feelings the word invokes might be desirable or not. The word sketch feature in Sketch Engine can instantly show the contexts in which the word is used and the associated connotation can be inferred from them. The information is based on the analysis of multi-billion word samples, called corpora, of text which guarantees that any topic or text type is included. 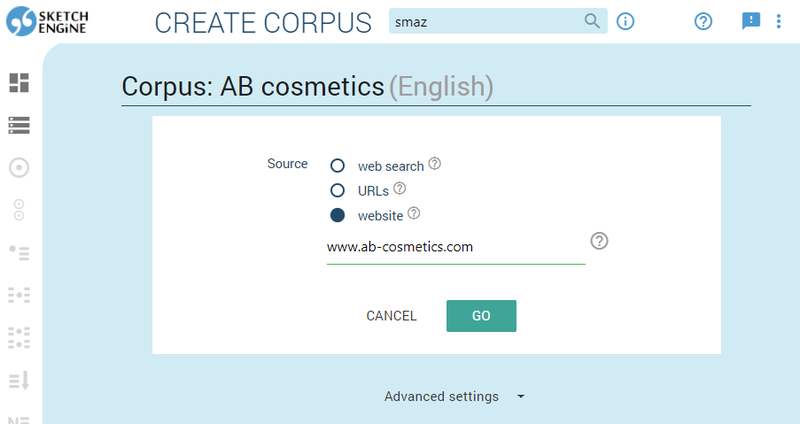 Moreover, the user can build a specialized corpus to check the usage in. 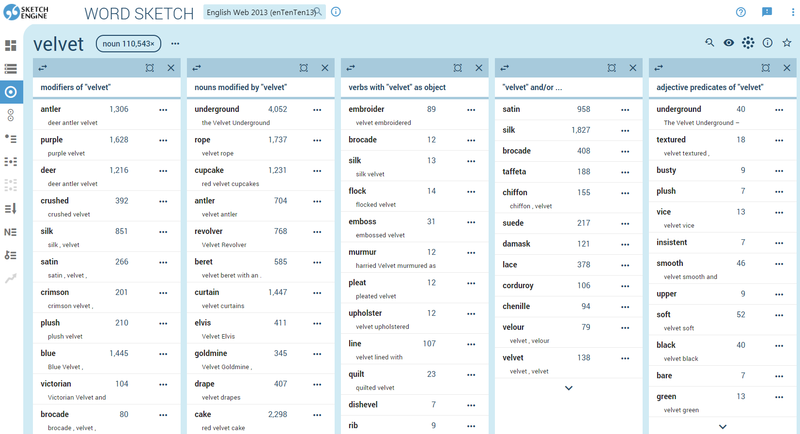 Sketch Engine supports morphological analysis and linguistic criteria which can be used for text analysis of materials produced by the competition. The process of building a database of such texts (=text corpus) is fully automatic. The user only needs to upload marketing materials in common text formats or point Sketch Engine to suitable web content and texts will automatically be uploaded, cleaned, morphologically analysed and tagged for parts of speech. 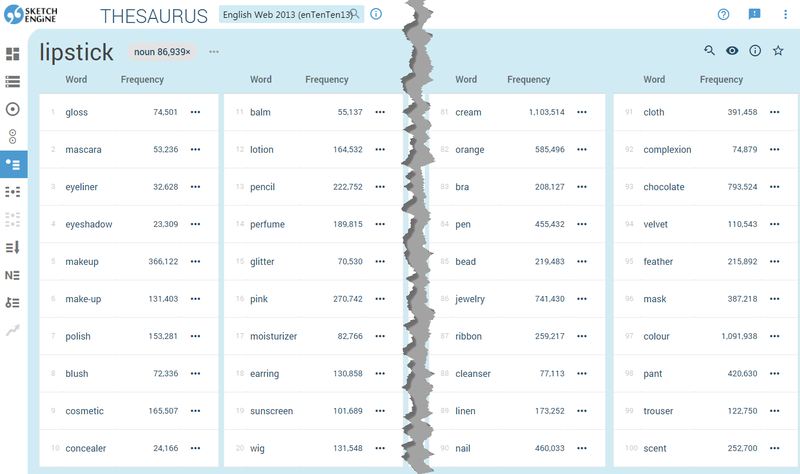 The resulting text corpus can be used with the tools in Sketch Engine, namely, with the thesaurus, word sketch and keyword and term extraction to understand how the competition communicates with customers and what type of message they focus on. Sketch Engine can download texts from the web resources or build a text database from files the user uploads and processes them into a text database (corpus) ready for text analysis. Morphological analysis and part-of-speech tagging are carried out fully automatically.